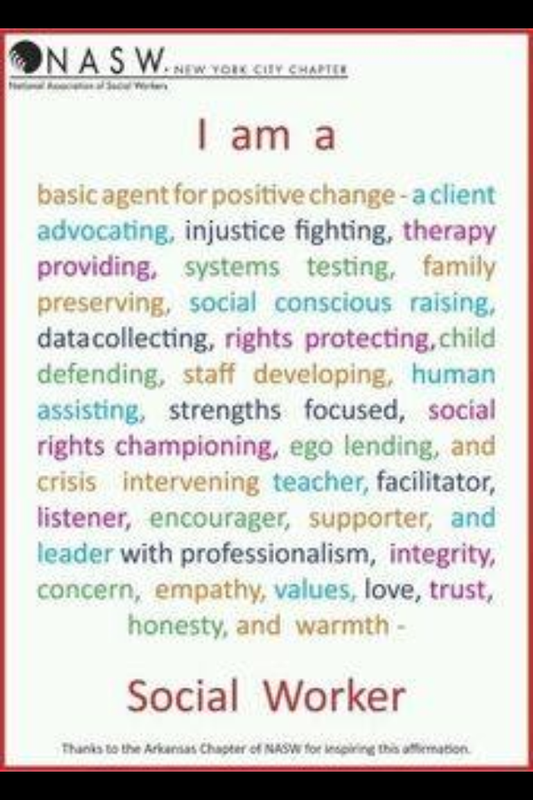 So the month of March is Social Work month so I thought that I should post something related to that. To be honest, I didn’t want to be a social worker growing up. I wanted to go to medical school and be an ER doctor. Unfortunately my high school education in the sciences was very skimpy. I took Algebra I and II and Biology. No chemistry whatsoever. Needless to say, I quickly realized after my first Biology class that I was missing a whole lot of the fundamentals. To be honest I had no idea what I wanted my major to be as I began to prepare to move away from home and start college. While I knew that I wanted to go to medical school, I knew that I didn’t want to major in the sciences. I remember standing in the registration line for college and when I got to the counter the registration lady asked what major I wanted to declare. For some reason the words “social work” came out my mouth and I just stuck with it. I did this with the understanding (at least in my head) that I would just take all the classes needed in order to ensure my admission into medical school. However I soon realized that without any reference point in the sciences, I would have a hard time taking the necessary classes and actually passing them. So I did what any person with common sense would do—quickly formulated a plan B. I decided that the social sciences were more suited for me and they held my interest. One of the things that I like about social work is that it’s very person centered and takes the individual, their background, and their environment into consideration. The field is so diverse and there are a lot of opportunities to make a difference in the lives of others. While I love the other social sciences, I’m appreciative of my social work education because it is fairly practice based and while there are mounds of paperwork, many times I get the chance to actually interact with people and implement interventions that improve their quality of life. This entry was posted in Uncategorized and tagged career, choices, college, experiences, field, life, professional, social sciences, social work, thoughts.